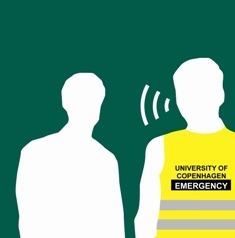 The same basic concept for evacuation applies to all buildings at the University of Copenhagen. The concept rests on the assumption that in dangerous situations someone will always demonstrate leadership. Therefore, the management has NOT appointed individuals responsible for evacuation. On their own initiative, individual members of staff will put on the west and assume the role of evaluation manager. The university’s buildings have been divided into evacuation areas. Stands containing a yellow and an orange west and evacuation instructions have been placed at strategic locations in each evacuation area/building. The instructions are given in Danish and in English. The evacuation manager will don the yellow west and make sure everyone leaves the building. The meeting place manager will don the orange west and proceed directly to the meeting place and make sure the evacuated stay together. The evacuation instructions describe how the evacuation and meeting place managers should act and the location of the nearest meeting place.